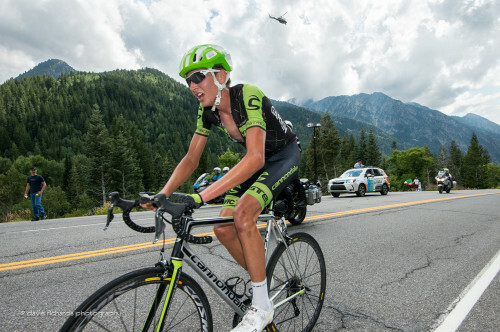 August 8, 2015 – Snowbird, Utah – American Joe Dombrowski of Team Cannondale-Garmin accelerated away from an elite group to win Stage 6 presented by University of Utah Health Care at the Larry H. Miller Tour of Utah on Saturday. Dombrowski soloed to victory on the legendary 6.4-mile climb of Little Cottonwood Canyon to Snowbird Ski and Summer Resort in a time of five hours and 20 seconds. A former Best Young Rider classification winner at the 2012 Tour of Utah, Dombrowski waited until the steeper pitches of the final seven miles to attack the whittled-down peloton. He was able to bridge across to his teammate Ben King, one of the last survivors of the early breakaway. Less than a mile later, Dombrowski crossed the finish line for a solo stage win and overcame a 27-second deficit to take the overall race lead in the General Classification. Wearing the leader’s yellow jersey on Stage 6, Michael Woods of Optum presented by Kelly Benefit Strategies led the chase group. Also in his group were pre-race favorites Fränk Schleck (Luxembourg) of Trek Factory Racing; Eritrea National Road Champion Natnael Berhane of Team MTN-Qhubeka presented by Samsung; and Chris Horner of Airgas Safeway Cycling Team. Woods took the four-man sprint for second place on the stage, crossing the line one minute and 17 seconds behind the stage winner. Berhane finished third, with Schleck and Horner in fourth and fifth, respectively. The stage win for Dombrowski put him in the Larry H. Miller Dealerships overall leader’s jersey, with a 50-second time advantage on the G.C. over Woods. Schleck moved seven spots to third overall, one minute and seven seconds down. Horner, who finished second overall at the Tour of Utah in 2013 and 2014, jumped to fourth spot on G.C., one minute and nine seconds behind Dombrowski. Utahn Robbie Squire of Hincapie Racing Team was very active at the front on Stage 6, finishing 11th on the stage and moving up three spots on G.C. to ninth overall. “Two podiums in two days is pretty crazy considering I hadn't podium'ed at this level of a race yet, so definitely really special. For the team, we've had three podiums in three days so that's pretty cool. It was a good day,” commented Woods about the success of his Optum presented by Kelly Benefit Strategies team at the Tour of Utah. The Tour of Utah’s “Queen Stage” lived up to its reputation as one of cycling’s most demanding days in the saddle, with 12,959 feet of climbing and four Utah Office of Tourism King of the Mountain climbs. The consecutive hard climbs decimated both the early 12-rider break and the peloton over the course of 110 miles. Woods and his teammates were put under pressure immediately as the race started in Salt Lake City. A group of 10 riders off the front quickly swelled up as more and more riders bridged across. Teams represented in the move included Cannondale-Garmin Pro Cycling, Jelly Belly presented by Maxxis, Team MTN-Qhubeka presented by Samsung, Axeon Cycling Team, Team SmartStop , Airgas Safeway Cycling Team. Quickly the gap went up to 15 seconds and things started to unravel for the Optum p/b Kelly Benefit Strategies in their defense of the yellow leader's jersey. Sensing the danger, Woods did the one thing he could do to shut it down, he bridged across forcing the peloton to chase and close down the gap. Three riders Team SmartStop's Rob Britton, Jack Bobridge of Drapac Professional Cycling and Greg Daniel of Axeon Cycling Team split off the front while the rest of the break was re-absorbed by the peloton. All this after only eight miles of very aggressive racing. The attacks continued until a chase group of nine riders formed and ultimately connected to the trio at the front after the first KOM, the climb up Little Mountain. The breakaway of the day included King, Dion Smith of Hincapie Racing Team, Daniel's teammates James Oram and Ruben Guerreiro, Britton and his teammate Flavio De Luna, Joey Rosskopf of BMC Racing Team, Sonny Colbrelli of Bardiani-CSF, Carlos Ramirez of Team Colombia and Johann Van Zyl of Team MTN-Qhubeka presented by Samsung. The 12 riders continued to push the pace up to three minutes by the second KOM, the climb up Big Mountain at 18 miles into stage. KOM leader Daniel easily took the first two KOMs of the day to consolidate his hold on the Ski Utah King of the Mountain Leader's jersey. Only nine seconds down in the G.C., Dion became the virtual leader on the road. Alarms rang in the peloton when the gap hit the five minute mark halfway through the stage. It was time for other teams to put riders in the rotation at the front of the field to allow their leaders to fight for the overall. So riders from the Drapac, Airgas Safeway, Trek Factory Racing and Jelly Belly presented by Maxxis joined with the Optum team at the front. The extra fire power helped to nibble away 30 seconds from the gap in 16 miles. At the bottom of the dreaded climb up Guardsmans Pass, the gap was under four minutes. Teams massed at the front in preparation of the 7.1-mile climb with its seven percent average gradient at high altitude. Riders were shelled from the break and from the field. Loving the steepness, Team Colombia massed at the front of the field to push the pace and crush legs. In the break, Rosskopf set a brutal pace, shelling all riders but Britton by the time they crested at 9,638 feet of elevation. The gap back to the dwindling field was 55 seconds. King was not giving up, and he would reconnect with the duo on the descent. Still at the front, the Colombian riders increased the pace, splitting the field with 10 miles to go. With no more teammates, Woods was isolated. 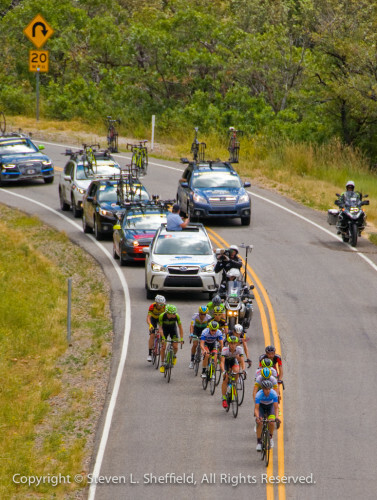 As the race turned onto Little Cottonwood, the gap was 30 seconds. With steeper pitches at the bottom of the final climb and a tailwind, the decisive attacks would need to come early. At less than five miles to go, the main group down to around 25 riders had the breakaway trio in their sights. “The Colombian team was riding at the bottom but it wasn't quite steep enough yet to make a selection. They had a couple guys swing off, and once it was getting steep, they were hitting it pretty hard and I saw Ben just up the road. I figured that I could go across to Ben and make a small selection, I know that Ben can really drill it for a kilometer or two, and really whittle it down. And that's sort of how we did it,” Dombrowski explained. Dombrowski put in his first attack to bridge across and Woods closed the gap with the rest of the contenders on his wheel. King went to the front while Dombrowski, Woods, Schleck, Squire, Horner and the others lined up behind him. After King pulled over one kilometer later, Dombrowski put in another acceleration with only Schleck able to match the pace. In the chase group, Schleck, Horner and Berhane sat on Woods forcing him to chase. The four stayed together until the final sprint for second taken by Woods. Tanner Flats, finished 87th on the stage, crossing the line 25 minutes behind the winner. He now sits 91st overall, 55 minutes and 18 seconds down. Utahn Erik Slack of the Jelly Belly presented by Maxxis team, finished 98th on the stage, 31 minutes and 50 seconds down. He now sits 86th overall at 49 minutes 50 seconds back. Finishing 10th on the stage, Colombian Daniel Martinez of Team Colombia moved up to seventh overall to become the Subaru Best Young Rider. Kiel Reijnen (USA) of UnitedHealthcare Pro Cycling Team recaptured the Utah Sports Commission Sprint Leader jersey. Fans selected Robin Carpenter (USA) of Hincapie Racing Team as the America First Credit Union Fan Favorite in the Best Ambassador (Statesman) category.